On Tuesday, Google announced changes to their AdWords ad rank formula going forward. The changes focus on the introduction of a third ranking factor, ad extensions and their expected impact. The changes were not unexpected but appear to have occurred before the announcement on October 22nd. 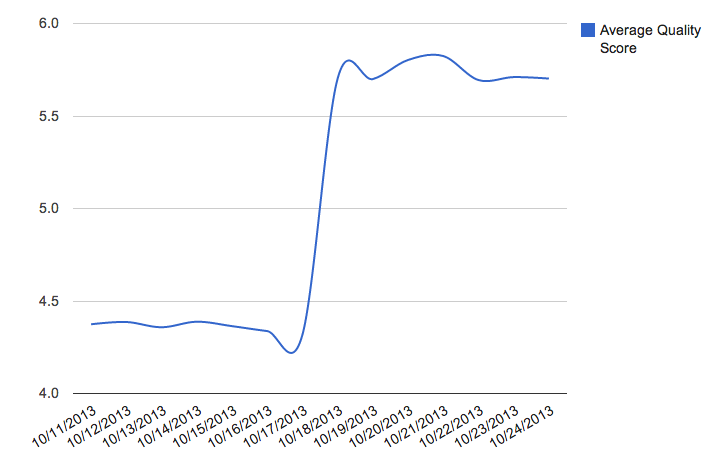 In fact, we are seeing that the Ad Rank update occurred October 18th. Across several different accounts, we saw a measurable jump in terms of expected account level quality score. While this does not guarantee that the change took place then, there is a strong likelihood, because no single day saw such significant jumps (positively or negatively) as October 18th across all accounts. The fluctuations that we see on that day were the largest single day shifts across thousands of data points. Further, there has been no fluctuation back. The expected account level quality scores have settled at this new normal and have only deviated slightly from the October 18th numbers across all accounts. Below I have averaged the account quality scores of the accounts we manage (the accounts cover products and services, small and smaller accounts, and across several different industries. Nevertheless, there is the specter of small sample size that I should disclose). You can see the jump from October 17th to October 18th. We have utilized ad extensions for some time as they provide searchers with more useful information for the ads we manage. We saw that all QS changes for the accounts we manage were positive. The jumps provide positive reinforcement for the idea that the changes occurred October 18th. Previously the use of ad extensions seeped into the ad rank formula because the use of ad extensions theoretically should improve the click-through rate of an ad which will then be reflected in the quality score in each impression auction. Now Google has moved beyond the implicit benefits of extension usage and made it a known factor in their paid search world. Let me know if you have seen similar changes.